Submitted by Satinder P S Puri on Wed, 10/24/2012 - 12:40. CALL FOR HUNGER STRIKE TO SAVE JOHN MARSHALL HIGH SCHOOL REPEATED AT OCTOBER 23, 2012 BOARD OF EDUCATION MEETING BY 70-YEAR OLD SIKH AMERICAN! Madam Link, Members of the Board of Education, and CEO Gordon. My name is Satinder P. S. Puri. *City Hall has meted out gross injustice -- through sustained & collusive inaction, and vote rigging – to petitioners who want to SAVE JOHN MARSHALL HIGH SCHOOL. *A School District that aspires to be the premier district in the United States and teaches our children ethics and fair play has not played fair with over 2,400 petitioners in the $50 million John Marshall High School (JMHS) Construction Project. Meanwhile the School District is getting ready to demolish our architectural gem having installed the infamous chain-link fence around John Marshall. The fence is also known as “Jackson & Sweeney’s Folly”. *Over 400 pages of correspondence show that Mayor Jackson and CEO Gordon have not been honest, trustworthy, accountable, clear, and transparent on the $50 million John Marshall High School Construction Project. Both Mayor Jackson and Councilman Sweeney are listed on the Facebook page as “WANTED FOR CONSPIRING TO DESTROY HISTORIC JOHN MARSHALL”. Sustained stonewalling: running out the clock with incessant delays extending into months, reminder after reminder after reminder, legal gobbledygook; absence of honesty, trust, and accountability, and now THE PLAIN DEALER IS IN BED WITH CITY HALL. *Governor Kasich was requested to order the School District to Cease and Desist from demolishing historic 80-year old John Marshall High School because of gross irregularities committed: collusive inaction, vote rigging, and denial of due process, and because the School District has not acted in good faith with over 2,400 petitioners who want to SAVE JOHN MARSHALL. *President Obama was also requested, via certified mail on October 13, 2012, to Investigate the gross injustice meted out to the petitioners. Copies of the letter were sent to the U.S. Justice Department and FBI Cleveland. A Hunger Strike is a Cry for Justice when due process is denied to citizens who have neither power nor wealth. If the School District brings in their bulldozers – then we are ready for a hunger strike to SAVE JOHN MRSHALL. If despite our best efforts, the School District engages in destroying our architectural gem, our auditorium, our underground running tracks, and our swimming pool – then the act of the wanton destruction will forever live in infamy – and so will the names of all those who facilitated the senseless act. The SAVE JOHN MARSHALL campaign is urging the voters of Cleveland with demonstrations to “VOTE NO TO TAX LEVY” because City Hall which has meted out gross injustice to petitioners -- can neither be trusted nor is accountable to citizens who have neither power nor wealth. 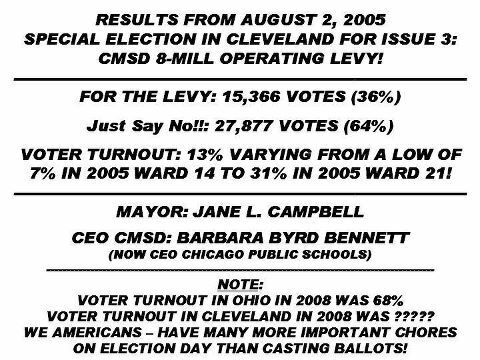 As of today (10-23-12), nearly 250 hours of demonstrations (equivalent to walking nearly 750 miles) using the VOTE NO TO TAX LEVY signs have taken place and the signs have been seen by thousands of Clevelanders. Submitted by lmcshane on Mon, 10/29/2012 - 09:11. NOTE: the great witness to civil rights history, Judge Jean Murrell Capers, VOTED NO! CLEVELAND ROAD WARRIOR, NATHAN RUTZ, IS ALL SMILES! Moving Forward with a Plan to Improve Cleveland’s Innerbelt!